Does Chicken Have to Be Completely Defrosted to Bake? How Long Do You Bake Chicken Parts on a Bone? 3 Does Chicken Have to Be Completely Defrosted to Bake? While a difference of opinion exists in the cooking world as to whether or not chicken cooked on the bone is more flavorful than boneless chicken, there is no question when it comes to cooking times. Bone-in chicken parts take longer to bake than their thinner boneless versions, because the bone interferes with the transference of heat throughout the meat. Bake the chicken minimally seasoned for use in other recipes or paired with other ingredients, such as rice or vegetables, for a complete one-dish meal. Baking chicken with the bones in will increase your cooking time, but the specific times depending on the size of the chicken piece. 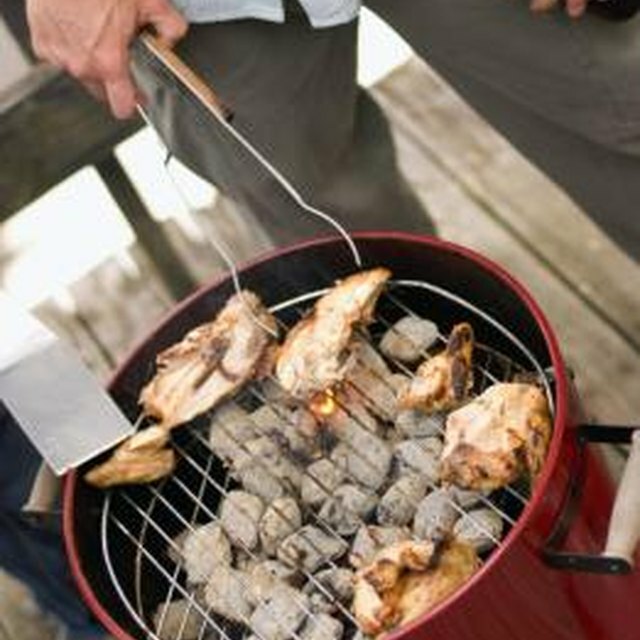 Use a thermometer as your guide, and cook your chicken to an internal temperature of 165 degrees. Chicken parts' weights vary depending on whether they are on or off the bone. A bone-in breast half, for example, weighs about 6 to 8 ounces, which requires a longer baking time, while a boneless half breast weighs in at just around 4 ounces. Bake bone-in breasts at 350 degrees Fahrenheit for 30 to 40 minutes, and bone-in whole legs, also called quarters, which include the thigh and drumstick for 40 to 50 minutes. Single drumsticks weigh about 4 ounces and should be baked for 35 to 45 minutes. Test for doneness by piercing the pieces at their thickest parts to allow juices to run. If they run clear, it's done; if they are even slightly pink, they're not. The most definitive way to test chicken for doneness is with a meat thermometer inserted into the thickest part of the meat but not touching the bone. A temperature of 165 degrees Fahrenheit indicates doneness. Deciding whether or not to use boneless or bone-in chicken is a personal preference dictated by time, cooking method and how the cooked chicken will be used. For salads, sandwich fillings or casseroles, boneless chicken makes more sense, as the cooked meat can be diced without much effort and there is no waste. But for a classic roast, marinated chicken, or whole chicken parts baked in a sauce or with vegetables, bone-in parts provide more structure and dry out less quickly. When baking bone-in chicken parts, it's best not to crowd them, so use a pan that is large enough to provide for some space between them. This allows the heat to move around the parts from all sides, assuring thorough cooking. You can bake the chicken on a sheet pan, in a casserole or in a cast iron skillet, and you can cut cleaning time in half by lining the pan with aluminum foil before adding the chicken. You can also cut calories by baking the chicken parts on a rack placed inside a shallow pan that allows the fat to drip away. Discard the fat or use it to make a gravy that can be served separately. Bone-in chicken parts are delightful when baked with just a light coating of melted butter or olive oil and a dusting of salt and pepper, but feel free to spice things up with other herbs such as rosemary, sage, marjoram, garlic powder and a splash of lemon juice, or any combination of your choice. Marinate the chicken parts with or without the skin for several hours or overnight in buttermilk, and coat with fine, plain or seasoned bread crumbs for oven-fried chicken. You can also try a simple balsamic vinegar marinade for a sweet-tangy taste.